I’m starting to think that after losing John Tavares this past offseason, things won’t be as bad as some of us think for the New York Islanders. At the time, it felt like the future of this organization took a sharp left-turn into a bridge embankment. Alas, there is life after John for this beleaguered franchise, and it’s lining up to be a long, prosperous one. The young core of Islanders players here and on their way into the mix is exciting. Robin Lehner, Christopher Gibson, and Thomas Greiss offer a viable trio of competent goaltenders (which as I’m sure many of you remember from last season is quite literally half the battle) until Ilya Sorokin and Linus Soderstrom make their way to the Island. Nick Leddy is a team leader and will continue to lead this young group by example, both on the ice and in the dressing room. Johnny Boychuk is coming off an injury-plagued season and is making a hefty salary — he’ll surely be playing with conviction in this writer’s opinion. Anders Lee was on the cusp of superstardom with Tavares by his side. I have a feeling that wasn’t just a product of playing with one of the game’s best, as it arguably could have been for many others (Kyle Okposo, Frans Nielsen, etc). He’s ready to take that next step and should be even more motivated to do so without JT by his side. Brock Nelson appears to have had a golden opportunity fall into his lap, being handed the keys to the Isles first line, centering Lee and Josh Bailey, who checks off a ton of the same boxes we filled in when discussing Lee. Nelson’s been a consistent player and is just now entering his prime. Did he have a very tough run last season? He sure did, but he finished strong and even showed remnants of being that fiery, tough guy we saw in previous seasons. To be perfectly honest, if Lou Lamoriello didn’t envision Nelson being a part of this team, he wouldn’t be here. We Trust in Lou. So should you. Then, not to be overlooked or have his name “forgotten”, is last year’s Calder Trophy winner Mathew Barzal. After a revelation of a rookie season, one has to believe his bag of tricks and nose for the puck has only gotten deeper and more refined, respectively. Personally, I expect another big year from him, but that’s another conversation for another day. The young guys (Kieffer Bellows, Devon Toews) and the new arrivals (Jan Kovar is a very intriguing player and seems to have a knack for being in the middle of the action) should give this team a new wrinkle. 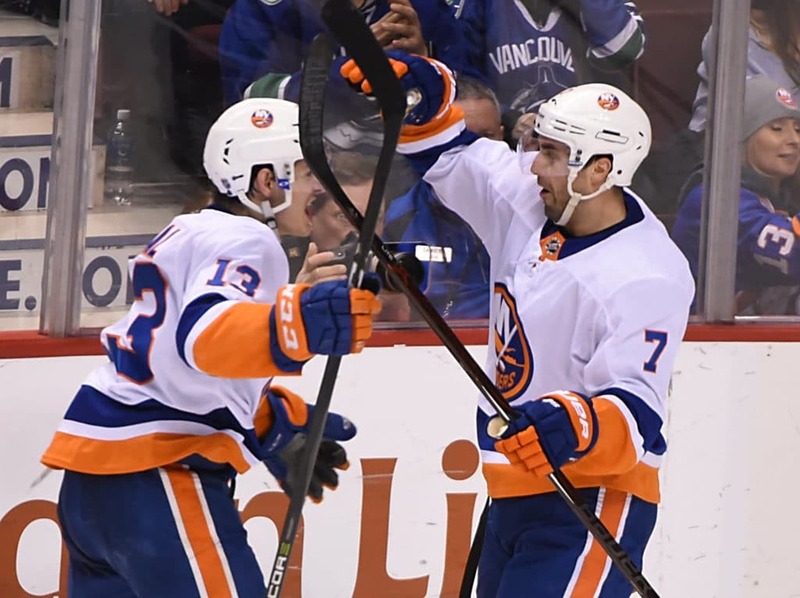 Under the leadership and tutelage of reigning Stanley Cup champion coach Barry Trotz and the eye in the sky, Lou Lamoriello, on his grind in the front office, it really does feel like a new, yet still exciting era for the New York Islanders. Bottom line, John Tavares left. That’s the scenario. He went home to play for the team he loved growing up and got paid a ton of money to do it. Would any of us do it differently? Again, another story for another day. But even without Tavares, the star-studded future of this organization still shines as brightly as ever. Here’s to an exciting, progress-filled 2018-19 season. Lets Go Islanders.